Every year during Diwali we cleanse our homes to invite Lakshmi, the goddess of wealth into our lives. We buy clothes, jewellery and even cars and homes to begin the year on an auspicious note. We do everything possible to keep our loved ones protected and safe. So, why compromise on one thing that matters a lot in today's time - car insurance, especially when a lot of our time is spent on the roads? From the increase in intercity or interstate road trips to the number of hours spent commuting every day to and from work in cities like Mumbai, Delhi and Bengaluru, people spend a lot of time in their cars on the roads. 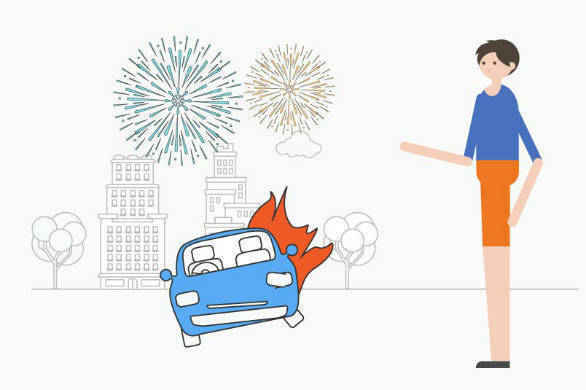 Therefore, this Diwali, along with clothes and jewellery, you should purchase a car insurance policy that keeps you and your family safe. Choosing a comprehensive car insurance policy along with add-on covers over a basic third-party car insurance will give you and your loved ones enhanced protection. Let's take a look at the three basic add-on covers you should buy this Diwali to drive your cars without any worries. Buying a car, especially your first one, is one of lives' greatest joys. It is symbolic of the growth we are experiencing in our lives. And sometimes, these things that give us little joys may get damaged. And when you file for an insurance claim, you might realise that you were not paid the amount you expected. You might ask why? The answer is depreciation. Everything that you buy, including your much-loved car, depreciates as soon as it leaves the showroom. But imagine if you were told that your car claims can be protected against depreciation? Yes, you can do that with the Zero Depreciation add-on cover. This add-on cover protects your car against depreciation when making claims for damages to parts and paints. With this cover, you can truly ride your car worry-free. We always look for discounts when making purchases. Whether we are out to buy something as small as groceries or something as big as property, we are delighted when we are offered discounts. Several studies in the field of human psychology have shown that discounts also trigger the release of Oxytocin, the chemical that causes people to feel happy. But did you know that your car insurance provider too offers discounts in the form of No Claim Bonus? With NCB, you can accumulate discounts of up to 50 per cent on renewal of your car insurance if you have not made claims in the previous policy period/s. This 50 per cent NCB accumulates over a period of five claim-free years. But what happens if your car is involved in an accident and you make a claim? Unfortunately, you lose your NCB discount. So, what do you do in such a case? To save your NCB, you can either get your car fixed from a local garage yourself instead of filing for a claim or get 'NCB Secure' add-on cover, which protects your NCB despite claiming once during the policy year. In most cases, the former will only help if the discounts offered are greater than the costs of repairs borne by you. Now, let's talk about NCB Secure. This allows you to drive your car without any worries, and, further, even make one claim without any stress of losing your NCB discount. Protecting your car is important but protecting your loved ones even more so. We know there's nothing you would not do to keep your family protected and secure. So why miss out on covering them in your car insurance policy? A basic car insurance policy might not cover your occupants. However, a little care on your part can save you a lot of trouble ahead. By opting for the Enhanced Occupant Add-on Cover, you can cover the occupants of your car against bodily injuries causing permanent disability or death if your car is involved in an accident. You can buy gold and silver for your family this Deepavali, but having them covered against unforeseen risks is the most thoughtful gift you could get them. Let's begin with the year by protecting your near and dear ones including yourself and your prized asset, your car, by buying these add-on covers. The just-launched COCODrive offers Zero Depreciation, Enhanced Occupant Personal Accident and NCB (No Claim Bonus) Secure add-on covers, along with 16 other add-on covers, that will keep you and your family stress-free on the road.